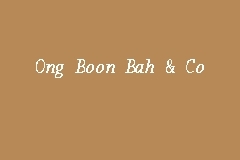 Ong Boon Bah & Co is an Independent Auditor with office located in Kuala Lumpur. Contact them to learn more about all the corporate financial services that they offer. Ong Boon Bah & Co is the external auditor for listed company CHUAN. This auditor take around 119 days to finalise the annual audited account. Auditor fee 372 thousand, charged by Ong Boon Bah & Co for Bintai Kinden Corporation Bhd FY 2016 is in market rate. Consider the Gross Assets of BINTAI was around 487 million and Turnover 478 million.